The house was almost full, even before the opening set — Billy Taylor’s piano trio — except for the conspicuous empty table to my right, which bore a RESERVED sign, unusual for Birdland. After the pianist finished his forty-five-minute set, a party of four men and a woman settled in at the table, rather clamorously, three waiters swooping in quickly to take their orders as a ripple of whispers and exclamations ran through Birdland at the sight of one of the men, Igor Stravinsky. He was a celebrity, and an icon to jazz fans because he sanctified modern jazz by composing Ebony Concerto for Woody Herman and his Orchestra (1946) — a Covarrubias “Impossible Interview” come true. Parker didn't just happen to know a few bits of Stravinsky to whip out as a novelty; he had, at that point, already deeply internalized the work of the man who composed The Rite of Spring (1913), the most rhythmically complex piece of orchestral music to date. 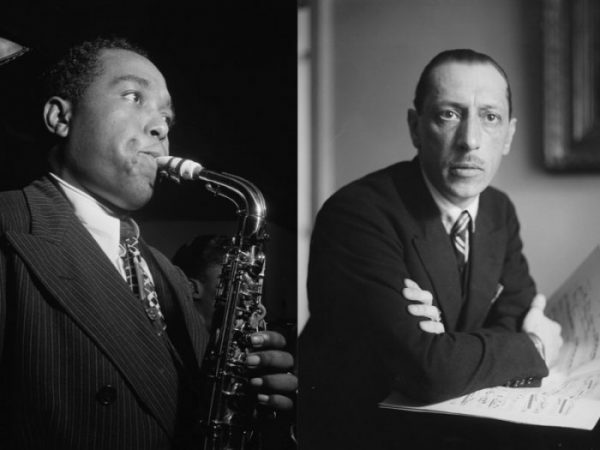 "Jazz musicians sat up in their seats when Stravinsky’s music started playing; he was speaking something close to their language," writes New Yorker music critic Alex Ross in his book The Rest Is Noise: Listening to the Twentieth Century. "When Charlie Parker came to Paris in 1949, he marked the occasion by incorporating the first notes of the Rite into his solo on 'Salt Peanuts'." In a piece on why jazz musicians love The Rite of Spring, NPR's Patrick Jarenwattananon discusses other instances where Parker quoted (or paid musical tribute to) Stravinsky: "A personal favorite comes from 1947, when Parker was a guest soloist on trumpeter and arranger Neal Hefti's 'Repetition,' as heard on a compilation called The Jazz Scene. Not only does Hefti's arrangement quote the transitional horn motif which signals the second half of the 'Augurs of Spring' movement from The Rite, but Parker riffs on the same motif to start his solo." Dylan Thomas: A Centenary Celebration contains a chapter by Daniel G. Williams on Dylan Thomas and Charlie Parker, which, in establishing Parker's engagement in "revivifying the vocabulary of jazz," gets into how that got him drawing from Stravinsky, whose work Parker called "music at its best." Williams quotes Parker's trumpeter Howard McGhee as remembering that Parker "knew everything, and he hipped me to, like, Stravinsky and all those guys. I didn't now nothin' about Stravinsky." When Parker brought The Rite of Spring over to listen to at McGhee's house, he prefaced the experience with these words: "Yeah, this cat, he's kind of cool, you know; he knows what he's doing." And the more we learn about what went into Parker's music, the more we realize that he, too, knew even more thoroughly what he was doing than we'd ever realized. Stravinsky is a caricaturist; Parker is an artist. Nobody took the bait, but don’t be discouraged; that’s very good trolling. Very interesting article! But why are you using low-contrast gray text, when black text would be much more sensible, and easier on your readers’ eyes?